A washer and a dryer are two of the most important appliances in a home. They work hard keeping up with the piles of laundry generated by most families, yet they are sometimes taken for granted when it comes to taking time to care for them. A few easy maintenance and operational tips can help these appliances perform more efficiently and substantially extend their life. Many appliance owners make the mistake of overfilling the washer, which can shorten its life. It is a good idea to read the user's manual to check for the recommended capacity for the machine before using it. Washers perform much more efficiently when they are not overloaded. It will help extend the life of the motor to wash smaller loads whenever possible. It will also help lessen energy usage. Use either powdered or liquid laundry detergent made specifically for washing machines or pre-measured detergent pods. Never use dishwashing soap in a washing machine. Too much soap will clog the machine and could cause it to malfunction. Most washer manufacturers recommend using dispensers for adding bleach or fabric softener. Chlorine bleach should be added to the dispenser after the machine begins the wash cycle. Only use liquid fabric softener in the softener dispenser. It is a good idea to turn off all water to the washing machine if it will not be used for an extended time. This prevents too much water pressure from building up which can cause hose leakage. Improper leveling will cause unnecessary vibration of the washer. 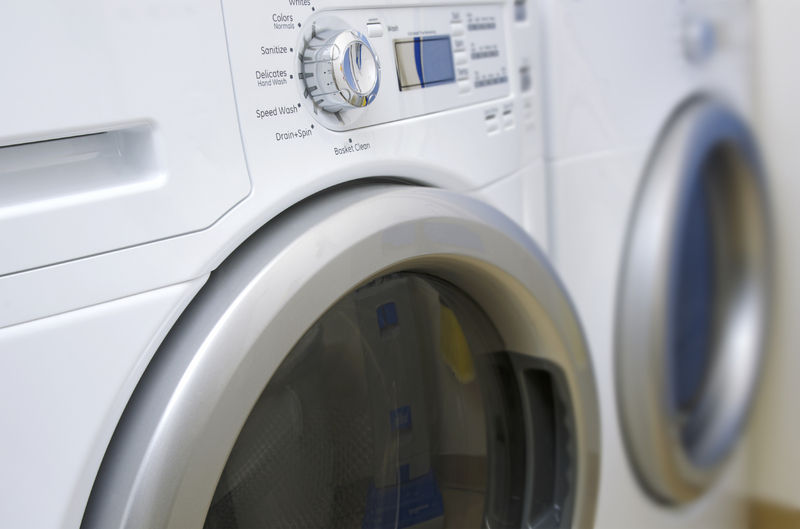 An off-balanced washer can cause severe problems with the washer or the motor. When even a small amount of water builds up in an unused washer, mildew or mold can result between washings. The inside drum should be allowed to dry completely after using by keeping the lid open until the next use. All dryers must have sufficient airflow at all times in order to operate efficiently. The lint filter must be cleaned after each load to ensure free flowing air inside the dryer. Lint that builds up in the filter causes an easily preventable fire hazard. These ducts fill up with lint and can cause the dryer to work harder than necessary. A lint-filled duct causes the dryer to take longer to dry laundry. It is also an energy drainer that can be prevented with periodical cleaning. The dryer must be completely vented directly to the outside to prevent possible fires. Vacuum the vent every few months to dislodge any lint buildup. A moisture sensor is designed to prevent clothes from over drying, as it is equipped with a sensor that turns the dryer off when it senses the clothes are dry. This feature also saves energy. When vacuuming and cleaning the dryer ducts, inspect the wiring for any damage that could potentially damage the dryer. If the duct is vented outside the house, make sure that it is not clogged by anything on the outside. Foil or plastic dryer ducts deteriorate over time and should be replaced when this occurs. Metal ducts are more flexible and safer. They last longer and can help extend the life of the dryer by preventing lint buildup in the ducts. Both washers and dryers work more efficiently, last longer and use less energy when operated properly. They must receive routine maintenance checks to prevent problems. A little prevention is the key to helping extend the life of these appliances. Even though washers and dryers are manufactured to last for several years, they must receive the best care to ensure their best performance for the entire life of the appliance. David Glenn is a home improvement expert. He freelance writes about home maintenance and DIY home repair. He's also knowledgeable about topics like how to improve social presence and building a reputation online. Good tip on keeping the lid to the washer open. I noticed a huge difference in the smell of my washer when I started doing this. Thanks for the great ideas!